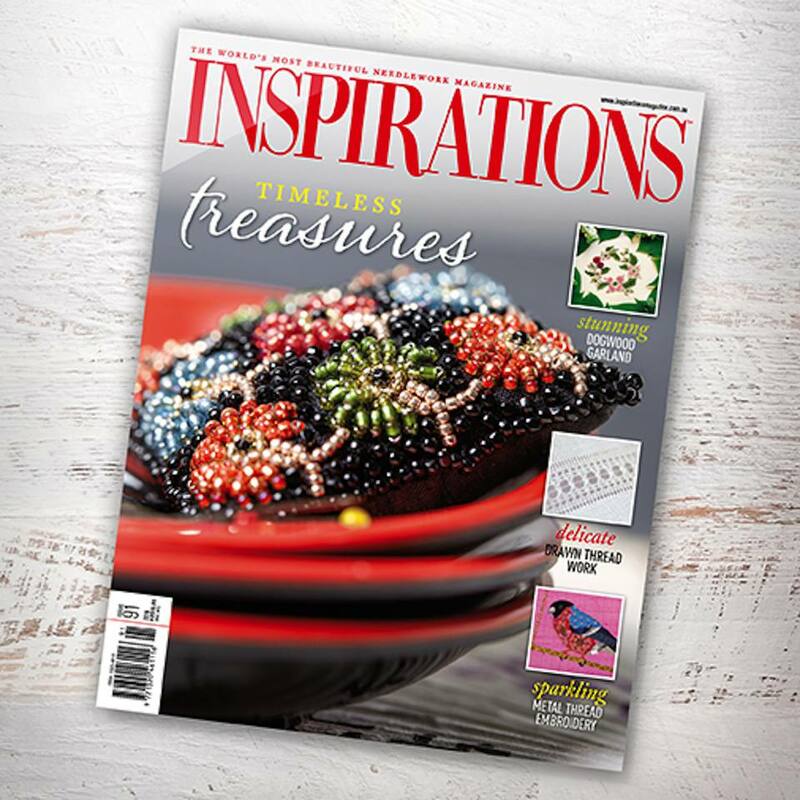 Inspirations is known as the world's most beautiful embroidery magazine for a good reason. Published in Australia and available in specialty needlework shops, fabric and crafts chain stores, and by subscription, this magazine is filled with high-end embroidery projects normally only seen in expensive hardcover books and kits. Designs by internationally-known teachers are included in every issue, along with complete directions and helpful step-by-step photos and illustrations. You can also buy the patterns and kits from their Stitchology.com.au site. It's available in print or as a digital download. Published by Country Bumpkin Publications, Edwardstown South Australia. ISSN 1320-4610. Publication averages 90 pages per issue, in English. Inspirations was launched in 1993 as a partner to the Australian Smocking & Embroidery magazine by Country Bumpkin Publications. It was aimed at the niche market of fine embroidery, going beyond they typical craft emphasis of most embroidery publications. In each issue, there are eight to 10 fully detailed embroidery projects sourced from master embroiderers around the world. The step-by-step photographs show everything in detail from start to finish. Once enticed, the reader can buy a kit that will enable them to make the project themselves at home. The circulation has been rising, especially in the United States. It is distributed in over seventy-two countries around the world. In the United Kingdom, it is distributed as Classic Inspirations. For traveling stitchers, see their Travel page for information on tours or cruises that feature learning from master embroidery tutors. Visit their Events page to see their yearly Beating Around the Bush convention, competitions, classes, and other offerings. This is one of my favorite publications, and I look forward to receiving it every quarter. Between its glossy pages are hours of inspiration, education, and opportunities to learn something new. I’m always amazed at by the exciting techniques and the imaginative use of common embroidery stitches featured in each issue by internationally known teachers like Trish Burr, Alison Cole, Carolyn Pearce, Jane Nicholas, Yvette Stanton, Margaret Light and others. Don’t be discouraged if some of the techniques featured in this magazine appear advanced. They’re actually very doable, and the photos and directions will guide you through the process with ease. You'll be amazed by the incredible photos of reader's submission featured in each issue, often by stitchers new to a particular technique. If you see something that inspired you, gather your embroidery threads and fabrics and start stitching!